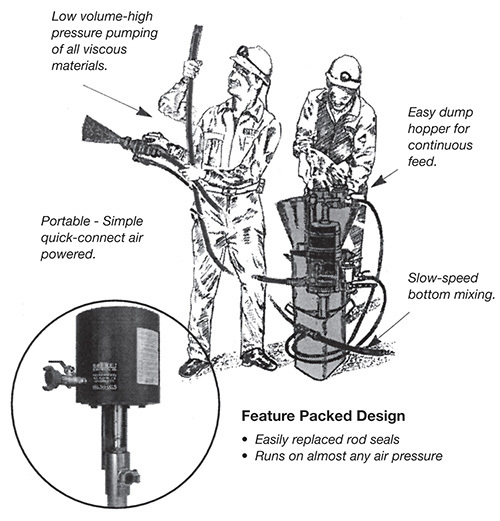 ConMico's Series 2500W spot location injector system is a fully operational “grout plant” embodied in a compact and highly portable design — the perfect solution to any mining, construction repair, or anchor bolt application calling for a low volume, portable injector system. It was created to satisfy the need for a high pressure injection system capable of being moved into small cramped quarters. Weighing only 20 kg (empty), the 2500W is a simple “bucket and sump” design, easily carried by just one man, and offers a quick cost effective solution requiring only a standard oiled or non-oiled air source meeting a minimum of 25 cfm (.014 m3/sec) to provide a continuous feed of grout or epoxy material. Its simple, but rugged construction requires a minimum of maintenance and has been designed for easy field replacement of parts and seals, if required, using off-the-shelf-components. ConMICO 2500W spot location grout injection pump - illustrating ease of use in tight or awkward spaces. ©2019 ConMICO Inc. All Rights Reserved.